Six-Flags, Cowboy Stadium, Rangers Ballpark, UT-Arlington – these are probably some of the things you think of when you think of Arlington. I am a transplant from Florida and attended UT-Arlington (UTA) from 2008-2009. If you asked me what I thought about Arlington back in 2009 well… I didn’t have much of an opinion at all. I liked the school well enough but never got any sort of vibe from the students, neither good nor bad. Many of my classmates were located a good distance from campus so we found ourselves meeting at night, or on weekends to accommodate for everyone’s schedule. 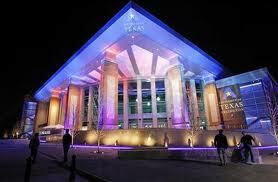 While at UTA I never once attended any type of sporting event nor was I even aware when they took place. I now work within walking distance of the campus and I’m amazed at the rate UTA and the City of Arlington are changing! It is starting to look like a different school and a new city, but in a good way. I think UTA has great potential and I am now envious of the students who get to be a part of this growth. Some of you may or may not remember talk of Glorypark, it was to be located right between Cowboys Stadium and Rangers Ballpark. However, that plan was scrapped almost right after it was unveiled in 2008 because of financial complications and lawsuits. Perhaps it was for the better, because Arlington now has the College Park District just a few miles away right in the heart of UTA campus. College Park is a $160 million dollar development, spanning more than 20 acres, encompassing UTA and the surrounding downtown Arlington area. As you drive in downtown you will see new restaurants, new shops, beautification of campus, and College Park Center itself which opened February 1 of this year. The development should be a boost to student’s sense of pride, as well as the faculty and staff. Just recently, plans to build a five-story, $35 million apartment complex near College Park, was approved. The hope is to not only draw students but professors, staff and others looking to live near the development. To read more about events, see a live webcam of the ongoing construction, and the FAQ (which is quite interesting to read) about the development click here. I would love to hear feedback from students about their thoughts on the growth of Arlington. Does any of this growth impress you or make you feel UTA is on its way to becoming more of a community? Do the additions to campus change your mind about pursuing more schooling at UTA? Any other thoughts are welcome!